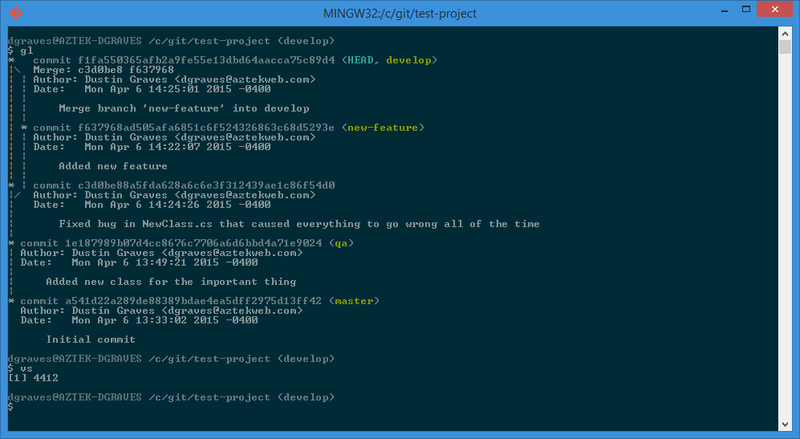 This is an exploration into the world of command-line git. If you are new to git or new to the command-line I would recommend taking a look through the Pro Git book if you want to learn more. From this point on I am going to assume you use, or at least are familiar with, git bash as pictured below. Any code blocks beginning with ‘$’ represent a command to be entered into this git bash command-line interface. Allow me to explain how easy it is to shape this environment to maximize productivity. One concept that is ingrained into my mind as a developer, is to abhor redundancy and inefficiency. As much as I have always loved git, I was initially frustrated with having to type the same verbose commands tens to hundreds of times every day. After learning my most common commands and a little research, I was able to come up with some aliases to reduce the numbers of characters for these tasks. This was done by adding lines in a configuration file to define these aliases. Git bash runs on top of the bash shell, which reads configuration from a .bashrc file located in your home directory (typically C:\Users\<UserName> and referred to as ~/ within bash). Either way you should now have the required file. Then with the editor of your choice simply add whatever aliases you wish to have into that file in this format (any line starting with ‘#’ is a comment and is ignored). Git also has its own system for aliases. These aliases can be added from the bash shell with one-line commands. This will add these aliases into your ~/.gitconfig file in the same directory as the .bashrc mentioned early. Feel free to take a look at everything in that file. More information on ‘git config’ can be found online. This is only the beginning. You can do some pretty impressive things by building on this idea. I find it useful to view a graphical history of a repository. Some GUI tools for Windows such as SourceTree allow you to do this, but this power is also accessible in the command-line with the “git log — graph” command. I like mine with many bells and whistles. Check the documentation for what these modifiers all do. alias gl="git log --graph --full-history --all --color --decorate=short"
I found myself frequently switching back and forth between bash and Windows Explorer to open up Solution Files (*.sln) in Visual Studio. Thinking there must be a better way, I came up with this script in my ~/.bashrc file. This lets me quickly get to Visual Studio when needed. A short command “vs” will grab the first *.sln file in my current directory and spawn a new instance of Visual Studio to load it up. More about bash scripting can be found throughout the Internet. Occasionally, I’ve found myself faced with the task of having to manually copy over every changed file to the production system. With a little bit of convincing, git can give me a list of added/modified files between branches. I can then safely copy over this folder and overwrite the old files without worry. Take git bash and make it your own. Spend some time to make aliases and make your life easier. Soon you won’t know how you ever lived without them.